My second stay at the apratments and Ive found the apartment to be very pleasant and convienient. Would stay there again. I booked for 1-Bedroom Deluxe Apartment (corner unit), and was amazed to see the interior which is tastefully designed! The apartment is well equipped with full set of kitchen apparatus, in-house washing machine & dryer. The balcony having a great view facing directly to Sky City Tower where I can see people jumped down from the tower (Sky Jump)! The tranquil Albert Park is just opposite the hotel, while the Auckland Art Gallery is around 1 minute by walk away from the premise. There was a confusion faced upon check-in at the reception counter, as the premise is recognized as Metropolis Hotel, and one would never be able to find 'Luxy' in the street, as Luxy is just a name appeared online but do not exist physically.... Luxy is depending on the staff of Metropolis Hotel to manage the check-in process. The staffs would say: 'We only help Luxy to deliver the room keys, and we don't know any other things about Luxy including the booking confirmation, terms and conditions and payment condition...etc" . Another disadvantage of this hotel/ apartment is unavailability of breakfast buffet. Comfy,amazing view and facilities. Extremely reasonably priced. Will definitely book again. really enjoyed staying here. location was good and perfect for what was needed. Second time stay for week or more. Rooms have everything you need and location and views are great for Auckland. We didn't get a harbor view this time but the park area was good viewing from the balcony. The apt was very comfortable, clean and with all the amenities needed. Close to good selection of resterants, shopping and Fish n Chips! Recommend with every confidence for a good stay. If you are over the corporate hotels, great option for a serviced apt close to CBD for meetings, and a meal. Good location. Front desk is helpful. 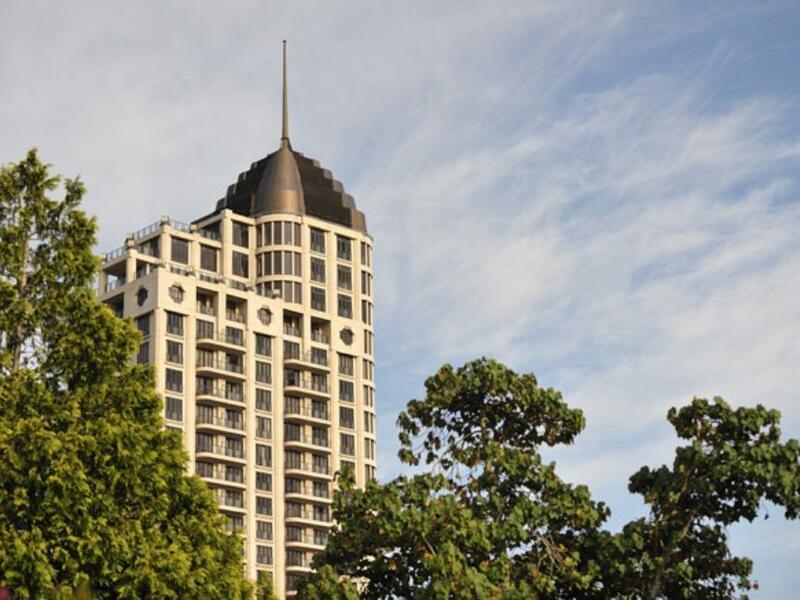 We stayed in apartment 2202 at the Metropolis, a large building in downtown Auckland. The location is great, just a couple of blocks from Queen Street and a nice walk to the waterfront. The apartment is tastefully decorated and well laid-out, with a (smallish) bedroom with good closet space and a queen size bed, open kitchen and living area, washer and dryer, tub and shower, dishwasher and full kitchen with hot pot, tea, pots and pans and dishes, microwave, as well as and great windows looking out in two directions, with waterfront and city views. The safe in the room was not working, and the information binder said that any non-working safe could not be repaired, but the building is secure, with key access even for the elevator floors. There is a nice indoor lap pool, two hot tubs, sauna, and exercise room on the eighth floor. Our only criticism was that there was only one roll of toilet paper (not even a spare), and no paper towels, which seemed a bit odd. The supper market, New World, is only three blocks away and well-stocked. The rubbish bin hadn't been emptied, the bed hadn't been made properly and an hour before we were due to check out, someone (possibly cleaning staff) knocked on the door and let themselves in. They did apologise when they realised that I was still in the apartment. There was a shortage of accommodation in Auckland that weekend. We probably wouldn't stay again. The room was a good size and had a good view. The kitchen was sufficient and the bathroom was a good size. And the hotel itself is lovely The problem was the room was filthy. Dirty dishes still in dish washer (which was half full of rancid water) and the bed was gross, the doona didn't have a cover, was really old and stank and was covered in stains. We rented two rooms. The air conditioner in room 2012 did not work satisfactorily. Multiple burned-out lights in both rooms 2012 and 2202. Bed was so comfortable. Shower was fantastic. Great having washing machine and dryer. TV a bit small. Pool,gym and spas were excellent. Really enjoyed our 2 nights. My only problem was trying to contact the reception which they did not answer other than that the accomodation itself was good. A tad out dated but excellent accommodation on the heart if the city. Great pool and gym ! It was located within the inner CBD of Auckland. However since it is a serviced apartment, there wasn't any room service etc. The furnitures in it were a little rundown and i wasn't sure if we could use the oven as it looks very dirty.